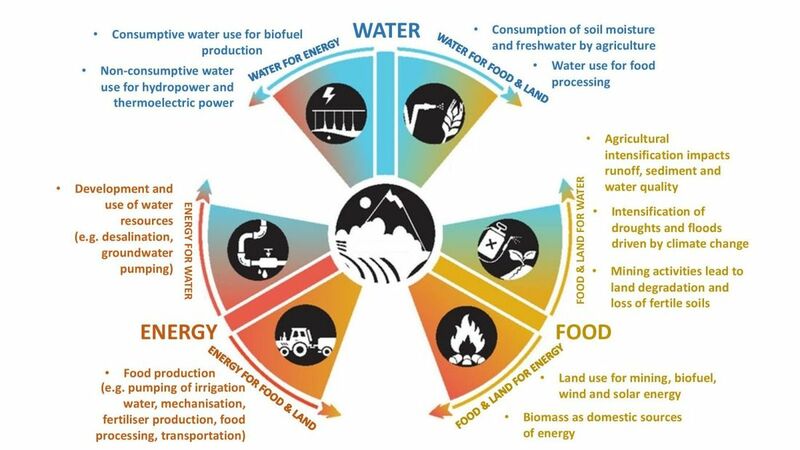 ​Water, energy and food are inextricably linked. 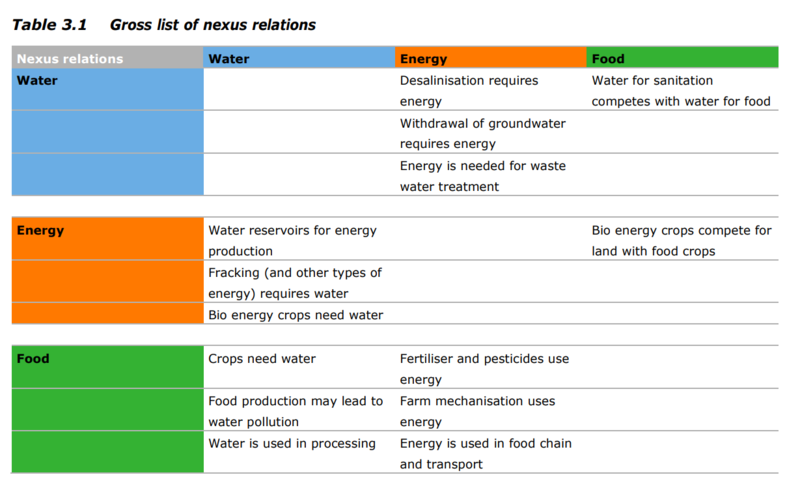 This is the so-called ‘nexus’. 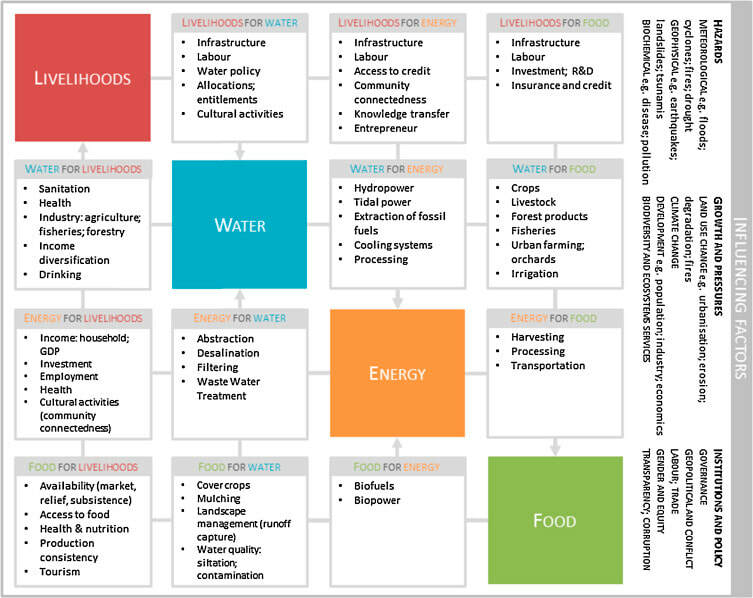 There is growing recognition that a movement is needed away from a sector-by-sector approach to policy, science and practice, towards an approach that considers the interactions between water, food and energy, while taking into account the synergies and trade-offs that arise from the management of these three resources. Water security is defined in the Millennium Development Goals (MDGs) as "access to safe drinking water and sanitation", both of which have recently become a human right. 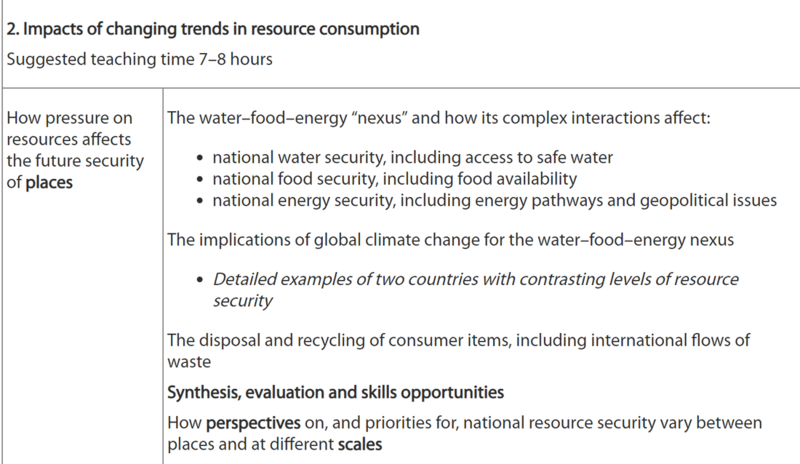 While not part of most water security definitions yet, availability of and access to water for other human and ecosystem uses is also very important from a nexus perspective. Energy security has been defined as "access to clean, reliable and affordable energy services for cooking and heating, lighting, communications and productive uses" (United Nations), and as "uninterrupted physical availability [of energy] at a price which is affordable, while respecting environment concerns". 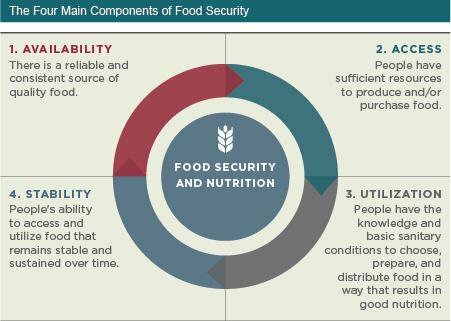 Food security is defined by the Food and Agriculture Organization (FAO) as "availability and access to sufficient, safe and nutritious food to meet the dietary needs and food preferences for an active and healthy life". Adequate food has also been defined as a human right. Once a material or finished product has served its intended use and has been diverted or recovered from waste destined for disposal, it is then considered "post-consumer." Having completed its life as a consumer item, it can then be recycled as such. This differs from "pre-consumer" or "post-industrial" waste, which is generated by industrial or manufacturing waste. Just about all industrial processes generate waste; the paper and printing industries, for example, recycle ends of paper rolls, misprints, scraps from trimming, etc. This pre-consumer waste is produced in large quantities in a relatively small number of locations; this is the polar opposite of post-consumer waste, which generally comes from our homes. As such, post-consumer waste is more difficult to separate and collect, but very important as it keeps tons of material from going to the landfill. Electronic waste, also called e-waste, various forms of electric and electronic equipment that have ceased to be of value to their users or no longer satisfy their original purpose. Electronic waste (e-waste) products have exhausted their utility value through either redundancy, replacement, or breakage and include both “white goods” such as refrigerators, washing machines, and microwaves and “brown goods” such as televisions, radios, computers, and cell phones. Given that the information and technology revolution has exponentially increased the use of new electronic equipment, it has also produced growing volumes of obsolete products; e-waste is one of the fastest-growing waste streams. Although e-waste contains complex combinations of highly toxic substances that pose a danger to health and the environment, many of the products also contain recoverable precious materials, making it a different kind of waste compared with traditional municipal waste. Globally, e-waste constitutes more than 5 percent of all municipal solid waste and is increasing with the rise of sales of electronic products in developing countries. The majority of the world’s e-waste is recycled in developing countries, where informal and hazardous setups for the extraction and sale of metals are common. Recycling companies in developed countries face strict environmental regulatory regimes and an increasing cost of waste disposal and thus may find exportation to small traders in developing countries more profitable than recycling in their own countries. There is also significant illegal transboundary movement of e-waste in the form of donations and charity from rich industrialized nations to developing countries. E-waste profiteers can harvest substantial profits owing to lax environmental laws, corrupt officials, and poorly paid workers, and there is an urgent need to develop policies and strategies to dispose of and recycle e-waste safely in order to achieve a sustainable future. The complex composition and improper handling of e-waste adversely affect human health. 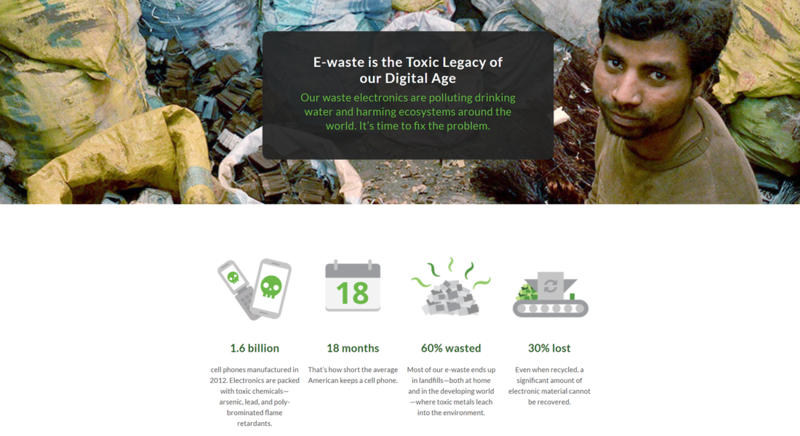 A growing body of epidemiological and clinical evidence has led to increased concern about the potential threat of e-waste to human health, especially in developing countries such as India and China. The primitive methods used by unregulated backyard operators (e.g., the informal sector) to reclaim, reprocess, and recycle e-waste materials expose the workers to a number of toxic substances. Processes such as dismantling components, wet chemical processing, and incineration are used and result in direct exposure and inhalation of harmful chemicals. Safety equipment such as gloves, face masks, and ventilation fans are virtually unknown, and workers often have little idea of what they are handling. For instance, in terms of health hazards, open burning of printed wiring boards increases the concentration of dioxins in the surrounding areas. These toxins cause an increased risk of cancer if inhaled by workers and local residents. Toxic metals and poison can also enter the bloodstream during the manual extraction and collection of tiny quantities of precious metals, and workers are continuously exposed to poisonous chemicals and fumes of highly concentrated acids. Recovering resalable copper by burning insulated wires causes neurological disorders, and acute exposure to cadmium, found in semiconductors and chip resistors, can damage the kidneys and liver and cause bone loss. Long-term exposure to lead on printed circuit boards and computer and television screens can damage the central and peripheral nervous system and kidneys, and children are more susceptible to these harmful effects. Although electronics constitute an indispensable part of everyday life, their hazardous effects on the environment cannot be overlooked or underestimated. The interface between electrical and electronic equipment and the environment takes place during the manufacturing, reprocessing, and disposal of these products. The emission of fumes, gases, and particulate matter into the air, the discharge of liquid waste into water and drainage systems, and the disposal of hazardous wastes contribute to environmental degradation. In addition to tighter regulation of e-waste recycling and disposal, there is a need for policies that extend the responsibility of all stakeholders, particularly the producers, beyond the point of sale and up to the end of product life. There are a number of specific ways in which e-waste recycling can be damaging to the environment. Burning to recover metal from wires and cables leads to emissions of brominated and chlorinated dioxins, causing air pollution. During the recycling process in the informal sector, toxic chemicals that have no economic value are simply dumped. The toxic industrial effluent is poured into underground aquifers and seriously affects the local groundwater quality, thereby making the water unfit for human consumption or for agricultural purposes. Atmospheric pollutionis caused by dismantling activities as dust particles loaded with heavy metals and flame retardants enter the atmosphere. These particles either redeposit (wet or dry deposition) near the emission source or, depending on their size, can be transported over long distances. The dust can also enter the soil or water systems and, with compounds found in wet and dry depositions, can leach into the ground and cause both soil and water pollution. Soils become toxic when substances such as lead, mercury, cadmium, arsenic, and polychlorinated biphenyls (PCBs) are deposited in landfills. 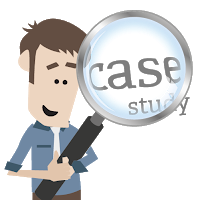 ​What is meant by the term ‘recycling’ of resources? 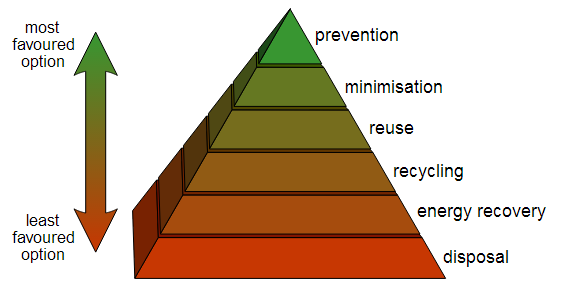 What is the preferred way of waste management? Giving examples, explain how recycling takes different forms in countries at different stages of economic development. 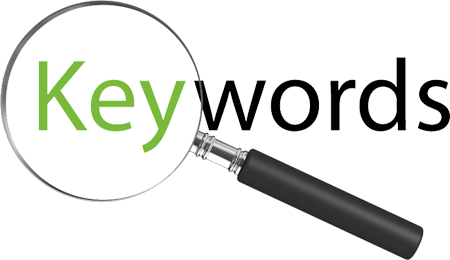 What factors are causing increasing quantities of e-wastes? 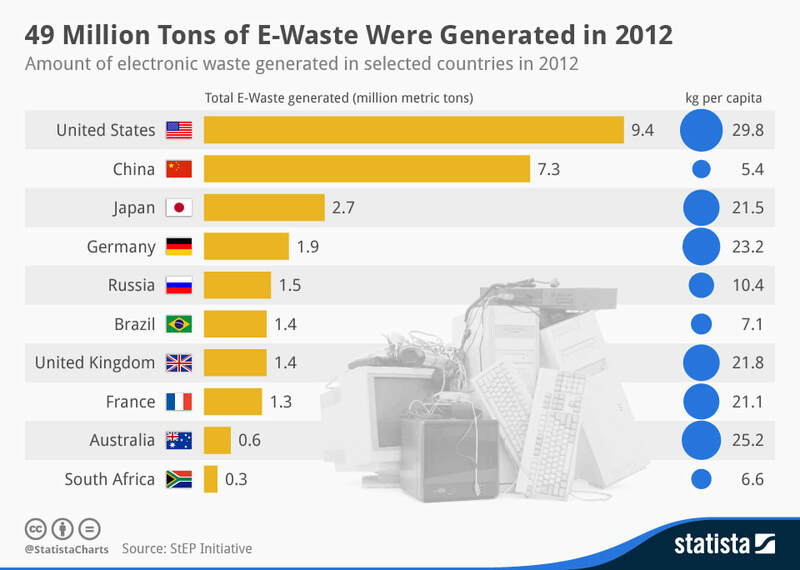 Describe the world distribution of e-waste production per capita. 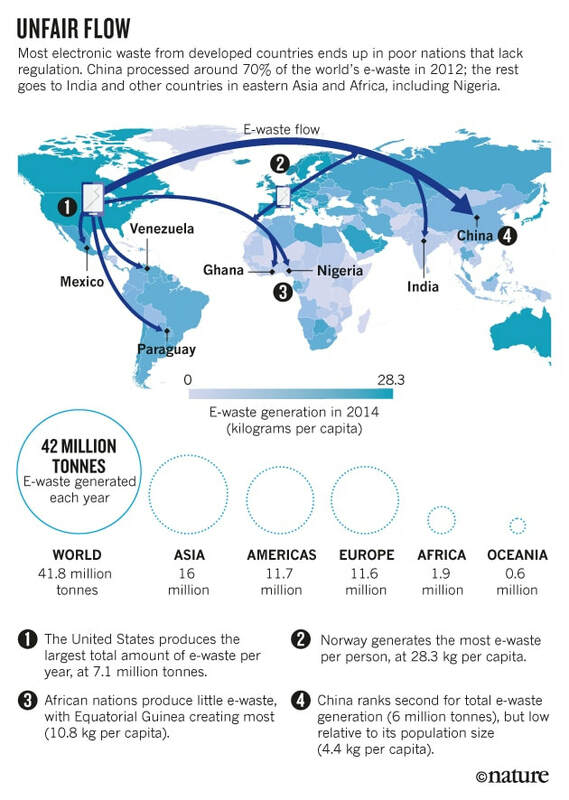 ​Describe the international flows of e-wastes. 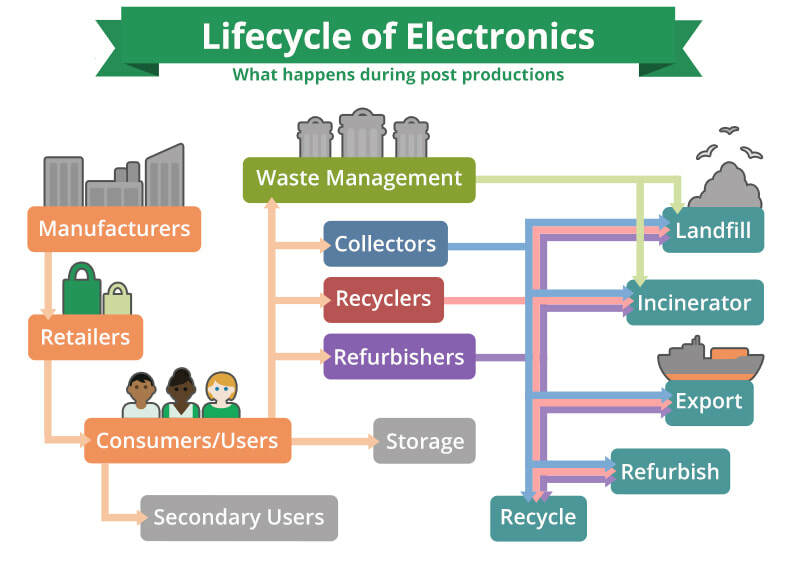 Why do you think the major destinations of e-waste might be attractive for entrepreneurs who are keen to recycle components and materials in used consumer items? ​Discuss the benefits and problems of the ways e-wastes are recycled.